The first academic program in the world for ethnomathematics, an increasingly visible, highly interdisciplinary and hands-on subject, will be offered by the University of Hawaiʻi at Mānoa College of Education beginning in summer 2018. Ethnomathematics is real-world problem-solving that is relevant, contextualized and sustainable through the integration of indigenous wisdom and 21st century learning. Aligned with federal and state standards, the UH Mānoa ethnomathematics program will develop teachers as leaders to discover multiple approaches to teaching and learning mathematics through project-based and place-based experiences that connect classrooms and communities. “As far as I know, no other academic program in ethnomathematics exists in the world. Thus, the ethnomathematics graduate certificate at the University of Hawaiʻi is an excellent opportunity for giving an appropriate academic role to this subject,” said former President of the International Commission on Mathematical Instruction Ferdinando Arzarello. “Its creation opens new paths for research, where mathematics can be looked at from fresh and exciting standpoints. It will certainly promote international cooperation within different communities of researchers, from mathematics to anthropology through a long list of intertwined disciplines” Arzarello said. The new ethnomathematics graduate certificate is the culmination of 10 years of building the UH Ethnomathematics and STEM Institute, under the direction of Professor of Mathematics Education Linda Furuto, with support from state and federal funding. 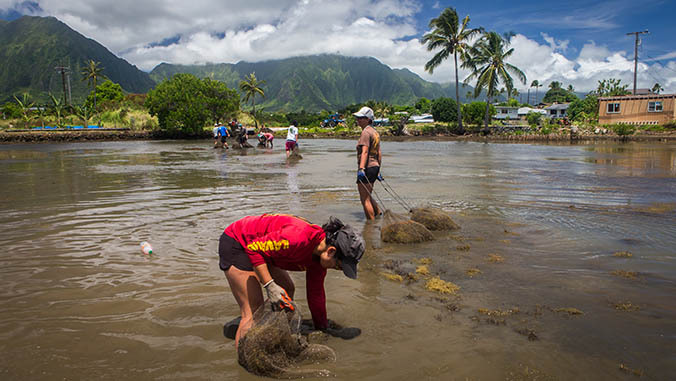 As part of the existing UH professional development program, educators have traveled to the Hawaiʻi Institute of Marine Biology on Moku o Loʻe, also known as Coconut Island, in Kāneʻohe Bay. There they study snapping shrimp and other creatures in the algae they collect. They listen for the snapping sound of the shrimp in a laboratory and test to see if the snapping gets louder and more frequent when a predator, such as a crab, is introduced. This leads to discussion on the mathematical aspects of sound waves that includes amplitude, period, wavelength and frequency. “After 17 years of teaching secondary mathematics, Ethnomathematics opened the door for me helping me become a better teacher incorporating cultural relevancy in my lessons which inspired my students to see that math isn’t just in textbooks but in their everyday world,” said mathematics teacher Janel Marr. Students of the new one-year certificate program will explore culturally sustaining, place-based and project-based mathematics pedagogy and practices that improve student success rates, especially for underrepresented populations in mathematics. The online program is designed for local and global working education professionals and will be delivered in a cohort model. With additional coursework and requirements, the graduate certificate may be extended to a master’s degree. The deadline to apply is March 15, 2018 (applications received after this date will be considered based on available space). For more information, including a program overview, funding opportunities and how to apply, please visit the enthnomathematics graduate certificate website. The Ethnomathematics and STEM Institute has been the subject of numerous online, print, television and radio features in the Mathematical Association of America, National Council of Teachers of Mathematics, Wall Street Journal, New York Times, Smithsonian Institution, Pacific Business News and National Public Radio. Most recently, the institute was presented with the UH President’s Green Initiative Award for its leadership in exploring sustainability and stewardship of our planet through mathematical sciences.